One immediate goal of this site is to facilitate evaluation and disposal of Roberta Bitgood's remaining professional collections, exercising all due diligence with respect to the potential value of certain materials for future researchers. We envision that to achieve this responsibly will require a review of the contents of the special collection currently maintained as the Roberta Bitgood Archive within the Charles E. Shain Library at Connecticut College. The extent of overlap or uniqueness of the undocumented materials in hand will be difficult to determine without systematic cross-comparison of particular groups of material. As a step in this direction, we plan to use this page to link to brief descriptive treatments of sample materials in several categories, including books, clippings, correspondence, manuscripts, notebooks, sheet music/scores, and printed programs. An interesting example of the semi-detailed analysis we believe will be helpful for establishing comparisons with the existing Bitgood Archive is provided by the online finding aid for the Stephen Schnurr Papers held at Indiana University, Northwest. We plan to post a notice at RB News & Notes whenever descriptions are available here for users to evaluate. Some materials (such as multiple copies or sets of sacred choral music) may also be offered for interested users to claim. As time permits, we also plan to explore sharing materials in other formats/media from this page, anticipating that visual and audio documentation of Roberta Bitgood's career may find its greatest value to users of this site as directly viewable or playable files. Once again, whenever we do add such materials to the site, a notice will be posted at RB News & Notes. 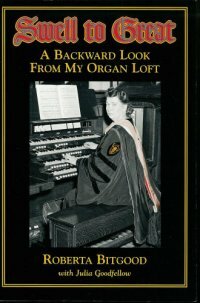 For the present, we offer a selection of images from Roberta Bitgood's autobiographical memoir Swell to Great: A Backward Look from My Organ Loft, co-authored with Julia Goodfellow and published in 2000 by The Bayberry Design Company.